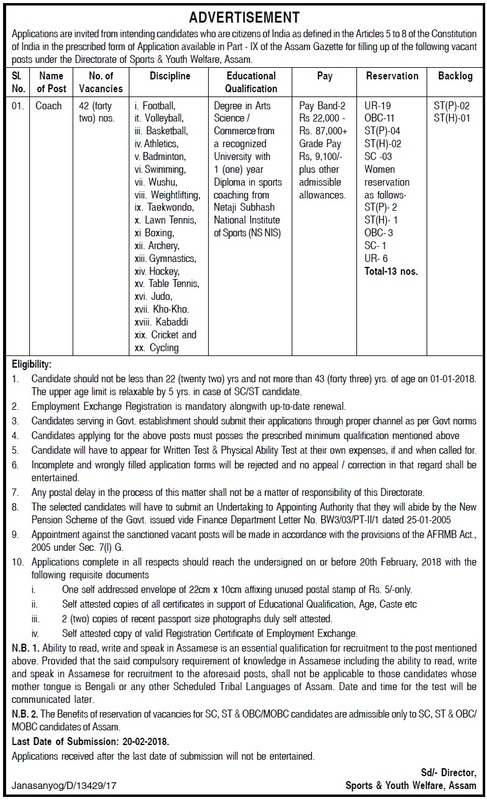 Applications are invited from intending candidates who are citizens of India as defined in the Articles 5 to 8 of the Constitution of India in the prescribed form of Application available in Part - IX of the Assam Gazette for filling up of the following vacant posts under the Directorate of Sports & Youth Welfare, Assam. Age: Candidate should not be less than 22 (twenty two) yrs and not more than 43 (forty three) yrs. of age on 01-01-2018. The upper age limit is relaxable by 5 yrs. in case of SC/ST candidate. Educational Qualification : Degree in Arts/ Science/ Commerce from recognized university with 1 (one) year Diploma in Sport from Netaji Subhash National Institute of Sports (NSNS). Disciplines: Football, Volleyball, Basketball, Athletics, Badminton, Swimming, Wushu, Weightlifting, Taekwondo, Lawn Tennis, Boxing, Archery, Gymnastics, Hockey, Table Tennis, Judo, Kho-Kho, Kabaddi, Cricket, and Cycling. Pay: Pay Band-2 Rs.22,001- Rs.87,000 + GP Rs.9,100/- plus other allowances. Selection Process: Candidate will have to appear for Written Test & Physical Ability Test at their own expenses, if and when called for. i. One self addressed envelope of 22cm x 10cm affixing unused postal stamp of Rs. 5/-only. iii. 2 (two) copies of recent passport size photographs duly self attested. iv. Self attested copy of valid Registration Certificate of Employment Exchange. N.B. 1. Ability to read, write and speak in Assamese is an essential qualification for recruitment to the post mentioned above. Provided that the said compulsory requirement of knowledge in Assamese including the ability to read, write and speak in Assamese for recruitment to the aforesaid posts, shall not be applicable to those candidates whose mother tongue is Bengali or any other Scheduled Tribal Languages of Assam. Date and time for the test will be communicated later. N.B. 2. The Benefits of reservation of vacancies for SC, ST & OBC/MOBC candidates are admissible only to SC, ST & OBC/ MOBC candidates of Assam. Last Date of Submission: 20-02-2018.